From Tuesday 2 to Friday 5 January. – The children’s festival Pau sense treva (Peace Without Truce)” of the district of Sants-Montjuïc was held in the Cotxeres de Sants. One of the days, the Sunday School of our church offered its traditional workshop to the children who attended to make cards with sugar and glitter. Sunday, January 7, in the afternoon. – We had not our Service in the church because we visited the Arenys de Mar Church to celebrate the Sunday School Service there, where the children of our church repeated the Christmas program as they did Sunday, December 24. Sunday, January 14, at 9:30 a.m. – The women of our church had their first “Desayuno con diamantes (Breakfast with Diamonds)” of the year. Sunday, January 14. – Last day of the Exhibition “500 years of Protestant Reformation”, which took place from October 17, 2017 at CaixaFòrum in Barcelona to commemorate this event from a historical and cultural point of view. From Sunday 14 to Sunday 21 January. – “United Week of Prayer”, an initiative of the Evangelical Alliance for more than 140 years, that serve to unite in prayer the evangelical churches of each city or region. This year, the theme was “Pilgrims and Foreigners”, at the proposal of the Spanish Evangelical Alliance. In Barcelona city, the Services from Monday 15 to Saturday 20 were held in the Ebenezer Biblical Church of 8-12 Gaiolà Passage. The Consell Evangèlic de Catalunya (Evangelical Council of Catalonia) used the meeting on Saturday 20 to celebrate the annual Thanksgiving United Service, this time for the 500 Years of Protestant Christianity. Message by Pastor Fran Cegarra. Sunday, January 28, in the afternoon. – Our pastor Benjamín López attended, on behalf of the church, the Installation Service of Francisco Mira as the new pastor of the Gracia Evangelical Church in 191 Verdi Street (Barcelona). Sunday, February 11, in the morning. – We had the pleasant visit of Pastor Ricard Bardés and his wife. He is president of FIEIDE-Catalunya, grade coordinator and professor at the Evangelical School of Theology (EET, in Spanish) and pastor of Viladecans Evangelical Church. First he announced the next activities organized by FIEIDE-Catalunya (Assembly and Congress, “Misión Posible 2018”, Training Day at IBSTE), then he told us about the training programs offered by the School of Theology (continuous training, degree and “Prepared to Serve”) andy finally he preached about the ‘receptibility’ of the Word of God, based on the “Parable of the sower” (Luke 8:4-15). Wednesday, February 21. – The American preacher Reverend Billy Graham (1918-2018) left for the presence of the Lord. On Friday, March 2, the act of thanksgiving for his life was held in Charlotte (North Carolina, USA), with the attendance of numerous guests, including President Donald Trump. At the end, the Reverend Graham was buried with his wife Ruth, who died on June 14, 2007, at 87 years old. Representing the evangelical churches of Spain were 5 people, led by the president of FEREDE, Pastor Daniel Rodríguez. From Friday 2 to Sunday 4 March. – Our pastors, Benjamin and Adriana, went to Gandia to attend the General Assembly of FIEIDE (Friday 2 in the morning) and the FIEIDE 2018 Congress, whose motto was “Guiding with Excellence” (from Friday 2 at night to Sunday 4). Wednesday, March 7. – The Federation of Evangelical Religious Entities of Spain (FEREDE, in Spanish) had the annual meeting of its Plenary Commission, which is the Ordinary Annual General Assembly of the entity and its main governing body. This year the venue of the event was the Christian Evangelical Church of Suanzes, in Madrid. Sunday, March 11. – Bible Society convened for this day the celebration of the “Bible Day 2018” in commemoration of the foundation on March 7, 1804 of the British and Foreign Bible Society, pioneer of the biblical work in Spain. Sunday, March 11, in the morning. – At 9:30 a.m. the women of the church celebrated the 9th anniversary of their “Breakfast with Diamonds”. Then we had the Communion Service, which was shorter than usual because after it we were summoned to the church administrative meeting, only for the members. In this meeting the main issues were: information about number of members (the church is currently made up of 56 members), presentation of the renewed website of the church, reading and approval of a previous act, approval of the economic balance for 2017 and the budget for 2018, and announcement of some projects. Tuesday, March 13. – The first informative meeting to prepare the return of the “Gospel Choir of Barcelona” will take place in the Evangelical Church of Verdi Street (Barcelona). After having dissolved in 2008, the Choir has announced a new performance in early 2019. The concert, presented with the name of ‘Reviu’ (‘Revive’ in Catalan), will be directed by David Suárez and will serve to commemorate the twentieth anniversary of the foundation of this musical ministry. The proceeds of the concert will go to the organization “Más que Salud (More than Health)” and the “Residencia Infantil Emmanuel (Emmanuel Children’s Residence)”. The more than 500 people who participated throughout the history of the Choir, if they wish to meet again, must register on the website that has been enabled for the occasion. All the rehearsals will be in the Church of 191 Verdi Street on Saturdays, May 12, September 29 and November 24 (January and February 2019, pending). Sunday, March 18, at 4:30 p.m. approximately. – Our pastor Benjamin López began to teach a Discipleship Class on basic biblical doctrines, which will continue in the coming Sundays. Sunday, March 18, at 6:00 p.m. – Special Service with the visit of the family of our sister Mercedes Ferrando, who left with the Lord on January 27. Wednesday, March 21, at 7:00 p.m. – First session of the “VI Theology Days in honor of José Grau”, organized by the Evangelical Center for Biblical Studies (CEEB, in Spanish). This year the conferences of biblical reflection are on the theme: “Christianity, Politics and History”. This first one, “A Biblical Perspective of Political Participation“, was in charge of Bernard Jaume Llenas at the CEEB premises in 2 Valencia Street (Barcelona). Sunday, March 25, in the morning. – Open Ceremony of the Plaça Samuel Vila. The city of Terrassa (near Barcelona) has recognized the trajectory of Pastor Samuel Vila Ventura (1902-1992) giving his name to this place. 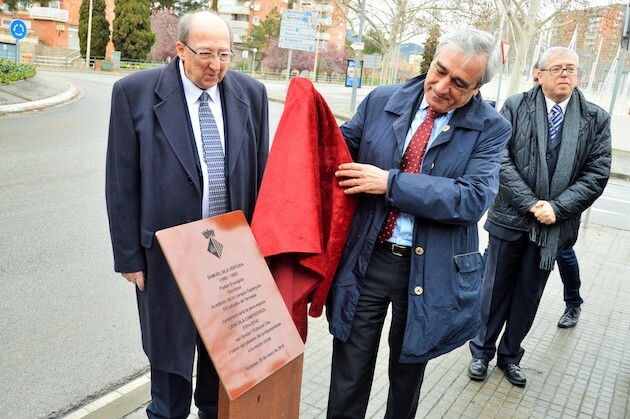 The event was held at the confluence of avinguda de Béjar with the Matadepera road, near the United Church of Terrassa. From March 29 to April 1. – The meeting “Misión Posible 2018”, aimed at young people between 13 and 25 years old, took place at the IES Pirámide of Huesca. Friday, March 30. – A group of our church went to Centelles (55 km from Barcelona) to visit our brother Agustí Màrquez and his family.